The 2017 National Prep School Invitational was a special weekend for Ignas Brazdeikis. After two outstanding performances against New Hampton School and Putnam Science Academy, scoring 27 against the latter, Brazdeikis was named to the All-Tournament team. Joining Brazdeikis, a junior, were current signees of five programs belonging to P5 conferences, including current powerhouses North Carolina and Florida State. The only other junior who received this honor? Consensus 5-star forward and fellow Canadian Simi Shittu. All in all, pretty good company to be in. Plenty of college coaches are beginning to notice Brazdeikis. Over the past month, he has added offers from Penn State, Pitt, and SMU to an already impressible stable. Prior to his recent tear, Brazdeikis held offers from Oregon and Baylor: two programs currently ranked in the AP Top 10, both with reputations for identifying top Canadian talent. Someone who isn’t surprised about these new developments? Nathan Johnson, Brazdeikis’s coach at Orangeville, Ontario’s Athlete Institute at Orangeville Prep. “In all honesty, it’s not unexpected,” Johnson says of Brazdeikis’s breakout pair of games at the NPSI and associated rise in recognition. “He’s been doing this since I met him last year. [With] all the hard work he’s put in, he’s just blossoming into the player we all knew he would be." As Johnson and Brazdeikis delve into the particulars of Brazdeikis’s game and how they impact the team, one theme seems to recur above all others: versatility. Offensively, Johnson readily cites the wide variety of weapons Brazdeikis has in his arsenal. According to Johnson, Brazdeikis’s versatility also manifests itself on the defensive end. Due to his athleticism, Johnson is often able to deploy Brazdeikis on the opposing team’s lead guard. Yet thanks to his 6’7’’ frame, Brazdeikis can adeptly match up against post players when Orangeville Prep decides to go small, and according to Johnson, “He can defend any [small forward] that we’ve played against.” This ability to guard multiple positions is something Johnson definitely sees Brazdeikis carrying with him to the next level. Brazdeikis is even able to apply a multi-pronged approach to less skill-centric areas of the game. His leadership is one such area Johnson is eager to highlight. “Last year he was one of the younger guys [on the team],” Johnson says. “This year, because we’re such a young team, he’s really stepped up as one of our major leaders on the year. He’s really unique in that he can do it vocally, but he can also do it with his play. His motor is really the biggest thing that other people pick up. He’s a leader by action and words. It’s rare to find people who can do it both.” Johnson further notes that Brazdeikis’s ability to lead verbally and by example is even more noteworthy considering he is only a junior. When discussing Brazdeikis, it’s only a matter of time before his role in the context of the Canadian basketball scene comes up. Much has already been written about the wave of Canadian players making their names on the world’s highest stages of basketball. Andrew Wiggins is a former #1 overall pick, Rookie of the Year and the face of the Minnesota Timberwolves franchise. Tristan Thompson is the starting center for the defending NBA champion Cleveland Cavaliers. The Denver Nuggets’ Jamal Murray is second among all Western Conference rookies in scoring. On the collegiate level, players like Dillon Brooks, Chris Boucher, and Xavier Rathan-Mayes have significant roles on teams poised to make deep tourney runs. What sets Brazdeikis apart from most of his fellow countrymen is his status as a truly homegrown player. 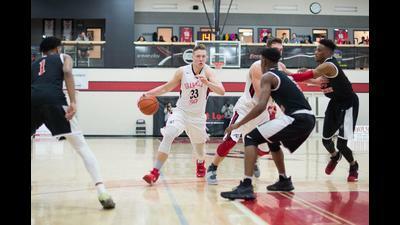 By remaining at Orangeville, Brazdeikis is bucking the trend of young Canadians venturing to the United States to play their high school/prep basketball. Orangeville Prep boasts two recent alumni — Murray and Milwaukee Bucks rookie Thon Maker — who have proved that college coaches and NBA scouts take players on the Canadian prep circuit just as seriously as their counterparts to the south. “It’s cool knowing that guys who were in my position here in Canada made it to the pros,” Brazdeikis says. “It makes me feel like I don’t have to go through the states or away from home to make it. I feel like I have an opportunity if I play well here to go wherever I want.” In addition to the aforementioned James Harden and Gordon Hayward, Brazdeikis considers two Canadians important sources of inspiration for his game: Wiggins for his ability to run the fast break, and former Baylor standout Brady Heslip for his trademark shooting touch. Judging by what he’s accomplished so far, finding a school that can provide him with that opportunity shouldn’t be a problem.